TJC Natural Pink Sapphire Bead String Necklace Platinum Plated Silver Size 18"
Ending Sunday at 8:30PM BST6d 19hFrom United StatesMetal: White GoldLength: 18 - 19.99"
Very impressive looking 925 sterling silver designer focal necklace with genuine multi colour Songa sapphires of blue, yellow, orange, amber red and green and adorned with tiny super sparkling cubic zirconias in an outstanding display of pure twinkling delight. Est. delivery dateEst. delivery Wed, Apr 24Metal: Sterling SilverBrand: UnbrandedLength: 16 - 17.99"
407 ct 5-6mm Round Shape Faceted Bead 3 Strand Necklace. Shortest Strand 16" Longest 18". Sapphire Real Earth Mined. This is such a lovely heart necklace with genuine sapphires. the necklace and the pendant is hallmarked. Pendant consists of a 5.750 Ct, oval shaped (cabochon) Star Blue Sapphire. The Star Blue Sapphire is triple A rated and of a rare size. Setting is platinum Plated Sterling silver. Unfortunately, I am having difficulty photographing to show the star. I think that you can however make it out on some photographs. Pendant is 2 cm x 1.2 cm of which the sapphire gem is 1.2 x 1 cm approximately. Setting is Platinum Overlay Sterling silver. I have matching rings and earrings listed also. Pendant was purchased without a chain however I will enclose a free 18 Sterling silver chain. Pendant will be delivered in a small pouch. Please see my other items for more gorgeous Jewellery and accessories. Stunning pendant in Sterling Silver. 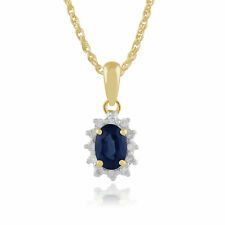 Pendant has 10 quality blue sapphire with combined gem weight of 2.000 Ct. The natural, blue, oval shaped sapphire are Kanchanaburi sapphire from Thailand. Pendant depicts The ‘ Circle Of Life’ with all 10 sapphire arranged in a ring of approximately 2cm diameter. Sapphires have the most gorgeous colour and clarity. Pendant has a matching 18’chain. Pendant will be delivered in a small pouch. Please see my other items for more gorgeous Jewellery and accessories. Charming solid silver necklace. the chain is 45 cm long cobra links and marked 925 (it tangles so it needs slight pulling before you put it on). made in Thailand. Collection station availableMetal: Sterling SilverStyle: PendantLength: 18 - 19.99"
Yellow Gold Real Sapphire Oval Cluster Pendant With 18" Chain UK Made Hallmarked. Set with real sapphire and cubic zirconia. Complete with an 18" 9ct yellow gold curb chain. Style: ClusterLength: 18 - 19.99"
790 ct 14-18 mm Round Shape Faceted Bead Necklace. Sapphire Real Earth Mined. Wear It Long Or Wear It Short. PRETTY PINK SAPPHIRE & DIAMOND 18" 9ct WHITE GOLD DELICATE PENDAN T & CHAIN. 9ct White Gold. Solid 9ct White Gold. PINK SAPPHIRE. Gem Origin Total Gem Weight Gold Type Gold Weight. The 9ct Gold chain is stamped 375 (9ct Gold). Gemmae Opes of Cambridge present for you consideration this 9ct Gold Sapphire and Diamond Pendant 18" Necklace weighing 1.72g. 15.3mm x 10.3mm width including bale, stamped 375 and JAN makers mark to the Bale. Est. delivery dateEst. delivery Wed, Apr 24Metal: Yellow GoldStyle: PendantLength: 18 - 19.99"
377 ct 6-7mm Round Shape Faceted Bead 3 Strand Necklace. Shortest Strand 16" Longest 18". Sapphire Real Earth Mined. 9ct Gold Sapphire and Cubic Zirconia Pendant and Chain. A Classic Pendant featuring one 2.5mm round cut Cubic Zirconia in the centre, surrounded by six 1.5mm Sapphires, claw set in solid 9ct Gold. All fittings are solid 9ct gold. AAA Ceylon Multi-Sapphire 925 Sterling Silver "Twist" Pendant & Chain. AAA Ceylon Multi-Coloured S a p p h i r e. 14, Round Cut, AAA Ceylon Multi-Sapphire's, 2.5mm in size. The Pendant sits on a 925 Sterling Silver Chain also 14K Yellow Gold Overlayed with a Bolt Ring Fastener. JEZLAINE SOLID SILVER NECKLACE,SAPPHIRE,ENGRAVED "DECEMBER - YOU ARE FRIENDLY"
Stunning solid silver pendant from designer Jezlaine. the centerpiece is a small sapphire gemstone (tested) round cut. a delightful calendar diary, open scroll details which shows December and the note "You are my friend" on the flap page. Est. delivery dateEst. delivery Wed, Apr 24Metal: Sterling SilverStyle: PendantLength: 18 - 19.99"
9ct Gold Sapphire Pendant and Chain. All fittings are solid 9ct gold. Featuring one 5x5mm heart cut natural Sapphire in a diamond cut solid 9 carat gold setting. This does not affect your statutory rights. Sapphire, 1 pear shaped gemstone. 925 Sterling Silver Sapphire Pendant and Silver Rope Chain. A superb pendant in excellent condition with a centrally fitted Sapphire gemstone. Size of the pendant is 1.7 cms in height (excl the baile) x 1.3 cms in width with a total weigth of the pendant and chain of 1.7 grams. AAA Sunset Sapphire 925 Sterling Silver "Circle of Life" Pendant & Chain. AA Madagascar Sunset Sapphire. 10, Oval Cut, AA Sunset Sapphire's, 4mm x 3mm in size. The Pendant sits on a 925 Sterling Silver Chain with a Bolt Ring Fastener. STUNNING PIECE OF JEWELLERY. 925 Sterling Silver. Striking pendant in 14K Yellow Gold overlay Sterling Silver. Within the setting are 8 round shaped, natural blue sapphire gems. 6 sapphire represent the petals of a floral cluster, another sapphire is at the centre and one above the flower. Within the setting at the side of the floral cluster is an area of sterling silver containing natural white Cambodian Zircon. Drop of the pendant is approximately 3 cm and width 2 cm. The matching 18” chain is also 14K Gold on Sterling Silver. The natural blue sapphire are Kanchanaburi from Thailand. Very attractive pendant. Pendant will be delivered in a Jewellery pouch. Please see my other items for more gorgeous Jewellery and accessories. Collection station availableMetal: Sterling SilverStyle: ClusterLength: 18 - 19.99"
The necklace weighs approx 24g / 14.9 carats. Est. delivery dateEst. delivery Wed, Apr 24Metal: Sterling SilverStyle: ClusterLength: 18 - 19.99"
A beautiful necklace featuring 2.75cts of genuine natural Sapphire and 1.25cts of White Zircon set into solid 925 sterling silver. Mother Of Pearl. 925 Sterling Silver. The necklace is 18" in length. Collection station availableMetal: Sterling SilverLength: 18 - 19.99"
9ct Gold Sapphire Celtic Pendant. A pretty Pendant featuring one 4mm round cut natural Sapphire gemstone set into a solid 9ct gold celtic design. All fittings are solid 9ct gold. These are real 9ct gold (NOT plated, rolled or filled gold) and are marked 375. 9ct Gold Sapphire Heart Pendant. All fittings are real 9ct gold (NOT plated, rolled or filled gold). Featuring one 5x5mm heart cut natural Sapphire gemstone in a solid 9 carat gold setting. This does not affect your statutory rights. 9ct White Gold Sapphire Heart Pendant and Chain. All fittings are solid 9ct white gold. Featuring one 6x6mm heart cut natural Sapphire gemstone in a solid 9 carat white gold setting. This does not affect your statutory rights. 9ct White Gold Sapphire Pendant. Classic style pendant featuring one 7x5mm pear cut Sapphire in a diamond cut, solid 9ct white gold setting. All fittings are solid 9ct white gold. This does not affect your statutory rights. Quin Jewellery. Gemstone Type : Sapphire (0.20ct) and Diamond (0.27ct). ~~~~~~~~~~~~~~~~~~. The necklace weighs 32.4 carats / 44g. Metal: Sterling SilverStyle: ClusterLength: 18 - 19.99"
An elegant milgrain style necklace crafted from 9ct gold, set with a round cut faceted sapphire gemstone. Stone Shape: milgrain style round. Sapphire Information Natural/Created: Natural Sapphire. Stone Size: 4mm. The necklace weighs 17g / 9.1 carats. Featuring one 4mm round, brilliant cut natural Sapphire gemstone set at the centre of this beautifully crafted, sterling silver Celtic Weave cross. Sterling Silver Sapphire Cross Pendant and Chain. All fittings are sterling silver. The Deep Blue Oval Cut Sapphire is Surrounded by 10 Sparkly CZ Stones. Stamped and Tested. Beautiful natural 1.00 carat Ceylon blue Sapphire set in a fine 18k white gold solitaire pendant. Sapphire is standard heated like nearly all sapphires on the market. Stunning blue sapphire with fine bright blue colour and excellent clarity. 9ct Gold Real Kanchan Sapphire Pendant With 18" - British Made - Hallmarked. Set with real kanchan sapphire. Complete with an 18" yellow gold curb chain. The necklace weighs 16g / 9.5 carats. A classic floral cluster design pendant crafted from 9ct yellow gold and set with 6 round faceted blue sapphires around a central sparkling diamond. Blue Sapphire Information. Diamond Information. Birthstone: September | Zodiac: Taurus | Wedding Anniversaries: 5th,45th and 70th. Yellow Gold Real Sapphire Pear Pendant With 18" Chain British Made Hallmarked. Set with real sapphire. Complete with an 18" 9ct yellow gold curb chain. The necklace weighs approx 21.8 carats / 22g. 9ct Gold Sapphire Heart Pendant and Chain. All fittings are solid 9ct gold. Featuring one 6x6mm heart cut Sapphire gemstone in a solid 9 carat gold setting. This does not affect your statutory rights. Unusual green Sapphire pendant with a sterling silver wrap which is in very good condition. No 925 marking appears on the pendant but this has been tested and is found to be sterling silver. Size of the pendant is 3.0 cms in height x 1.0 cms at the widest point with a total weight of the pendant and chain of 3.1 grams. TJC Multi Colour Sapphire Bead String Necklace Platinum Plated Silver Size 18"
9ct Gold Diamond & Sapphire Oval Pendant & 9ct Gold 18" Curb Chain. 18" 9ct Gold Curb Chain. Suspended on an 18" 9ct Gold Chain. 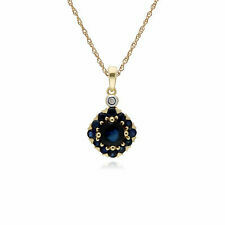 Classic Oval Drop Pendant with a rich oval cut Sapphire gemstone. Diamond & Sapphire Oval Pendant.